Around here it is summer and the Scarlet Pimpernels (Anagallis arvensis) are blooming. To many the Scarlet Pimpernel is a novel set in the time of the French Revolution. 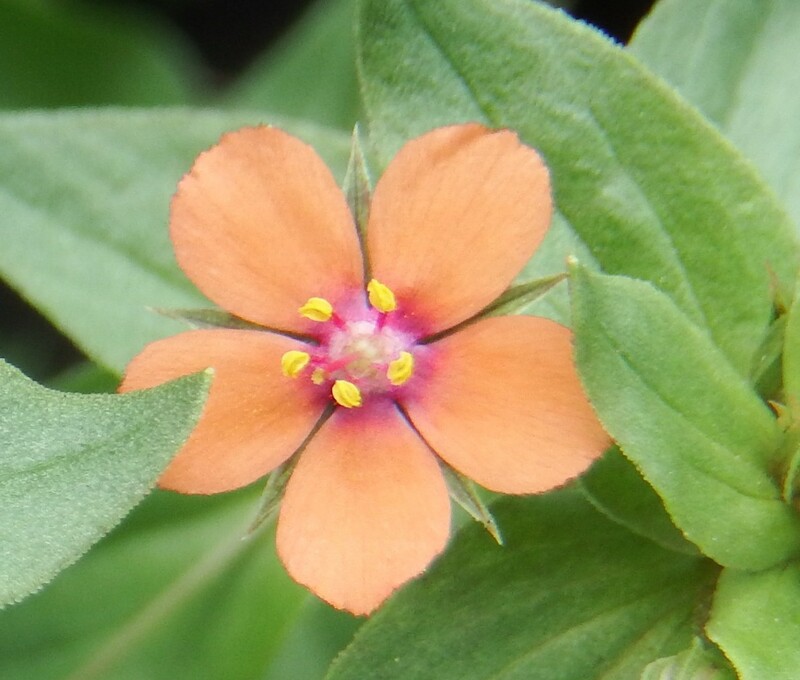 To me the Scarlet Pimpernel is a sweet little orange flower that occurs in lawns and some have the nerve to call a weed. 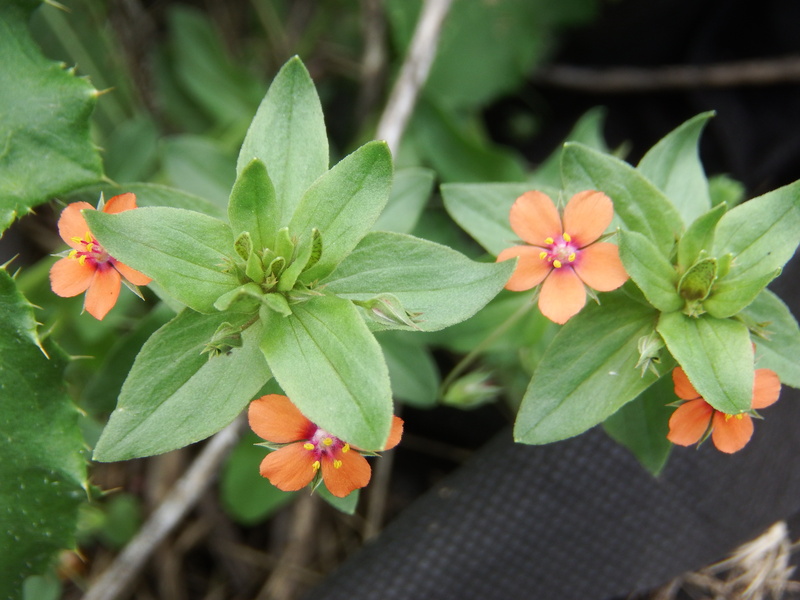 The petite scarlet pimpernel is an European native that made its way here as an ornamental. Dainty orange flowers with red centers dot the square-stemmed plant in summer. Found in disturbed sites and waste areas, this plant thrives in poor soils. First named by English Botanist Richard Salisbury (No relation that I have found…yet – but I mean there MUST be right?) this annual is also known as Poor Man’s Weatherglass because of its tendency to close its flowers at the “approach of foul weather” (Manual of Cultivated Plants, L.H.Bailey 1949). The Reader’s Digest Field Guide to Wildflowers also notes that this botanical barometer closes at dusk, fails to open in gloomy weather and responds to rising humidity by closing its flowers. Summer is also the time of book lists for beach reading. While I don’t generally go to the beach and read, I will have to add The Scarlet Pimpernel to my “to be read pile” (why is it that that pile never shrinks?) simply because it is named after a plant, not because it has anything to do with plants. There are some books out there I have come across and found even more enjoyable than I expected because of their unanticipated horticultural content. As you may remember from previous posts, I am a Stephen King fan. When I was much younger my face was always stuck squarely in a Stephen King novel. At some point, as I grew older and picked my head up long enough to realize there are other authors and other genres out there, and as I became more and more interested in learning about the natural world around me, I decided to vary my reading selections. I decided I would read one non-fiction book for each fiction book I read. Naturally, I began my non-fiction reading with Stephen King’s On Writing. This memoir/guide to writing drew me into the non-fiction world and I am hooked. I used to think reading non-fiction was the equivalent of reading a textbook for fun, and really…textbooks for fun? Categories: Define Interesting, Plants and Art | Tags: Anagallis arvensis, Barbara Kingsolver, Books and Plants, Cold Mountain, Dogwood, J.C. Vogard, LH Bailey, Richard Salisbury, Scarlet Pimpernel, Stephen King, Sumac, Tiffany Blues | Permalink.